Tree of Life - Y Goeden Bywyd. Britain was once covered in extensive oak forest, and reverence for Trees is at the heart of Celtic spirituality. Druids had their teaching centers in the midst of Oak groves, and the words for wood and wisdom are similar (Welsh gwydd and gwyddon). The Celtic Druids, priestesses and healer-women encoded their deep knowledge of trees and herbs into an ancient cryptic Tree alphabet - an Ogham cipher — Beth Luis-Nuin. The ‘Tree of Life’ is an esoteric philosophy common to many cultures and mythologies. The Ancients envisioned the entire cosmos in the form of a tree whose roots grow deep in the ground, branches reaching high into the heavens. Also known as the World Tree, the primal Mother Tree was regarded as all-nourishing, all-giving, involved in the creation of the universe and the origin of the first man and woman. Creatures representing the elements - the sacred Salmon, Heron, Horse, Dog, and Human folk are entwined within the greening vines of life. In the border motif (from the Book of Kells — a medieval manuscript) the pot represents this Source, or Earth Womb, also symbolized as the Grail, or Cauldron of Regeneration in Celtic mythology. 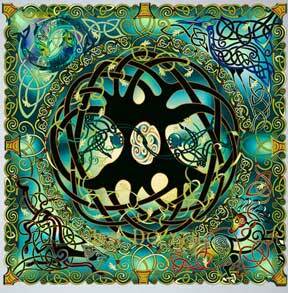 The interlacing branches symbolize the Celtic belief in the Continuity of Life.